I hinted in an earlier post that I was looking to go all old school and run a AD&D game for Kevin next time he is up. I’ve still got all my books from the late 70’s and early 80’s, the last time I played AD&D. Apparently they are called 1st edition now as AD&D has had 5 editions!! From this I have decided to not do the sides – I think they add nothing and will just get in the way of fat fingered gamers moving figures! 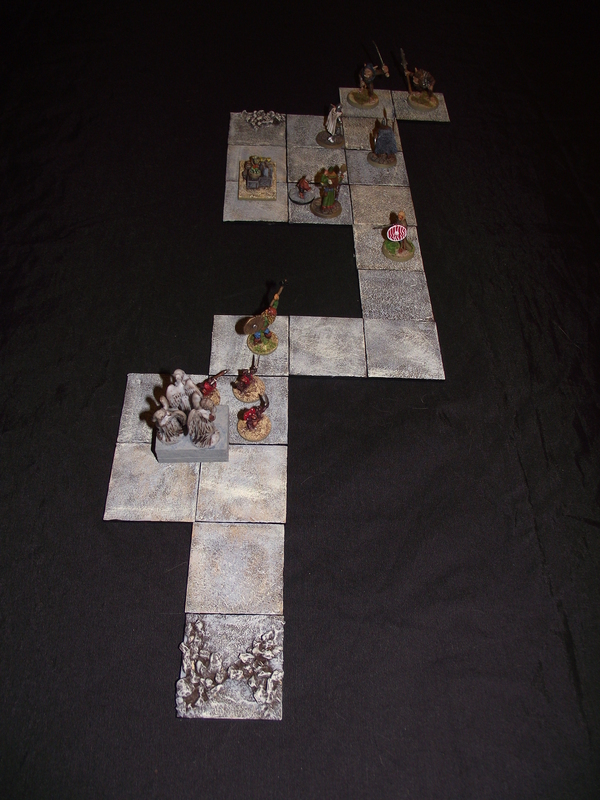 I have 50mm x 50mm base boards which I am going to use to represent a 10′ square bit of Dungeon. I thought about what the texture should be – it seems stone slabs is the thing to do – but I want my Dungeon to be a bit more ‘real’. Why would anyone bother to put down stone slabs in a tunnel cut from stone?. Obviously a soft clay/chalk tunnel maybe…………..am I getting to involved in detail??? Anyway the texture will be a simple sand and triple dry brush affair. 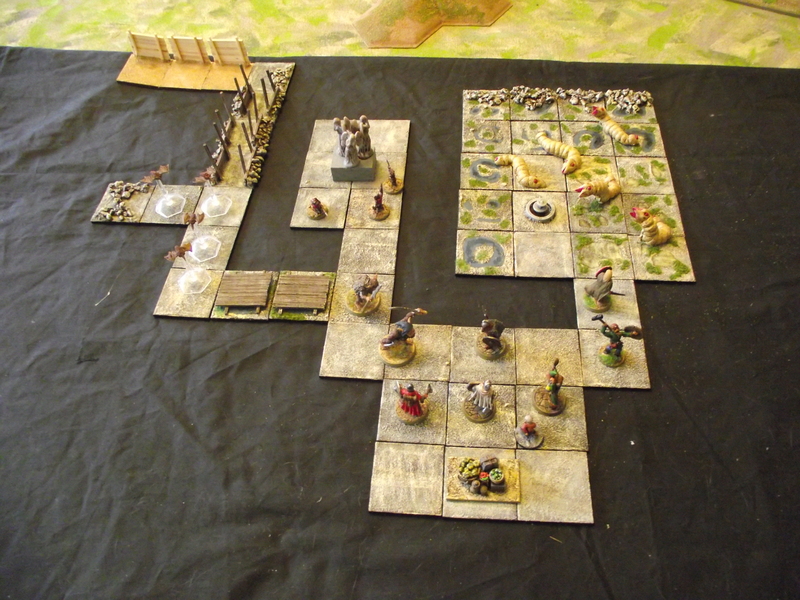 I am then going to add rubble, puddles, moss and all the other debris you would find in a unloved Dungeon. 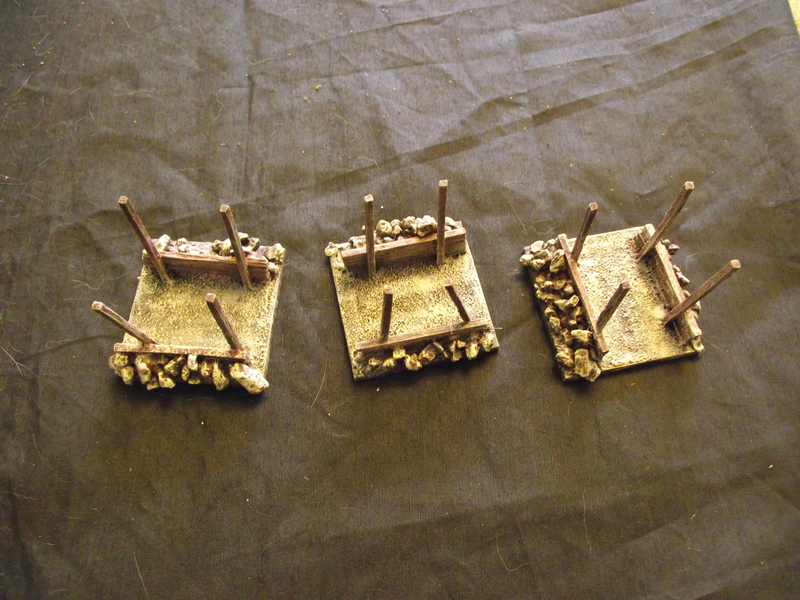 Here I have built some bases with rubble and then wooden retaining walls that look like they have been built to maintain the passageway. 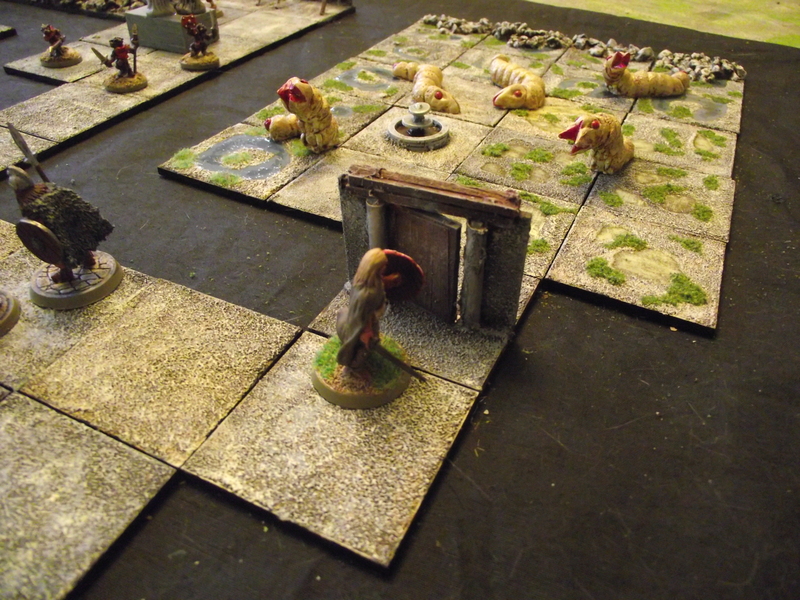 An early look at some bases laid out. 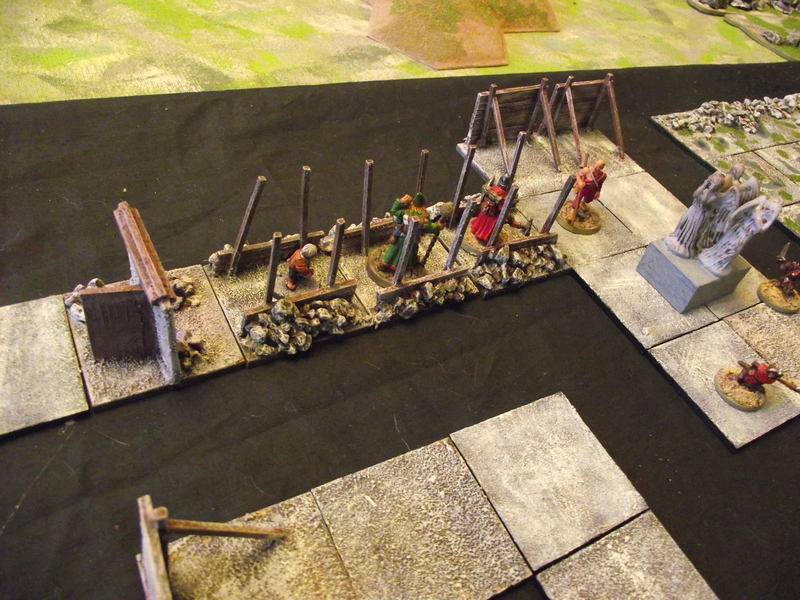 The Dungeon grows with bases with puddles and moss, and some wooden bridge pieces. Started to build some doors. 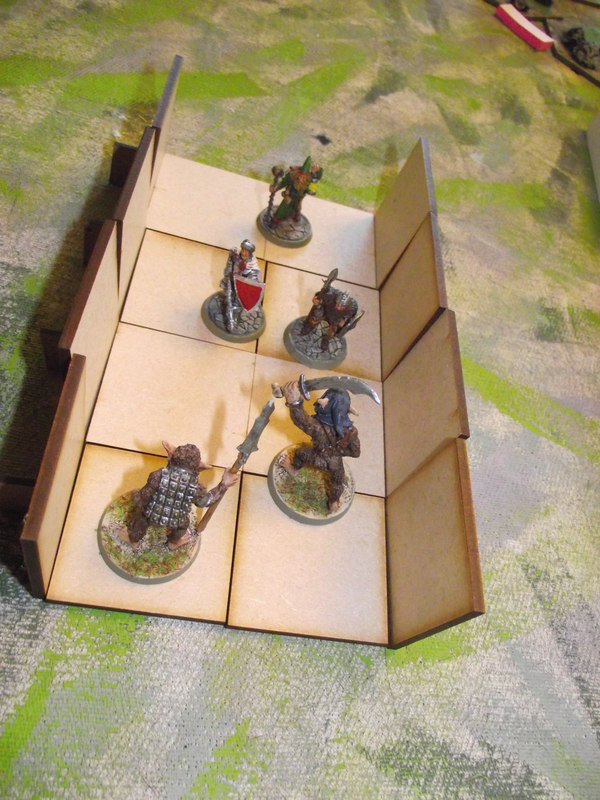 Doors are very important in AD&D – they keep the baddies away, they open up to treasure and adventure, or as above a whole load of trouble…….. I knocked this door up in 20 minutes – I know it shows. Another view of the ruined section, with another door. The three figures are Otherworld’s, the little hobbit (Boris; a liar and a thief) is an unknown from I think the 70’s. My friend Dave gave me a few boxes of all sorts of old stuff in it. So there you are – the aim is to have about 200 bases made and 20 doors – I am about 25% there.